Sometimes we get stuck in a rut where we can't figure out what to wear. Often times, I can't even put an outfit together. So in case that happens to you, here are a few cold weather outfit ideas that I've worn before. I hope they inspire you. This is a nice layered look for a more casual affair. Just wear a simple loose fitting blouse with a beige or brown jacket over top and some beige or brown boots. I used the same jacket in this outfit but I dressed it up a bit more with dark wash jeans and I added an extra layer for warmth. A solid white cami looks great under a dress blouse that you leave unbuttoned (or you can button it up!). A simple cami under a leather jacket with a blanket scarf, neutral pants, and black booties makes a great look anytime you will be outdoors perhaps shopping in the city. 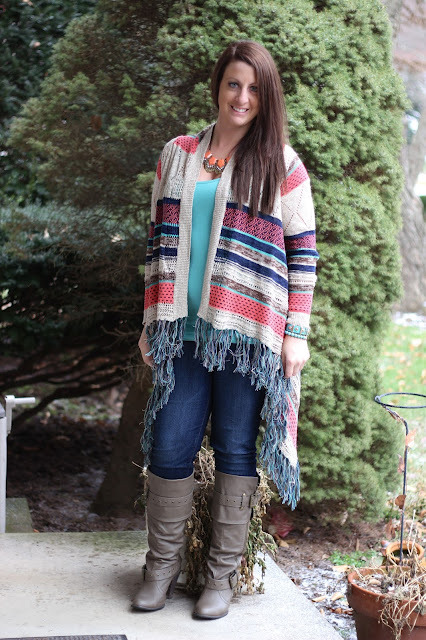 A solid color cami matched with a color from a poncho looks amazing with jeans and a simple pair of boots. It's comfy, cozy, and keeps you warm. Every girl needs a pair of leopard boots as statement, trust me! So pair those (or if you don't have leopard boots use a leopard scarf) with black denim and a grey sweater. Hopefully these have given you some ideas of stuff to put together from your own closet! Thanks for the winter style inspiration. youre welcome! thanks for stopping by! These are all great outfit for the winter. Yes they do! They are a must! Thanks for reading!